The Stinkin Rich slot game is a Vegas old-school classic and a game I love playing when I want to bring back memories. It is a blast from the past, from when video slots were in their infancy. Although I wouldn't say that this is a legendary game, like Cleopatra or Wheel of Fortune, it is a wonderful game with lots of nice features. Here, we have a free version to play with no download required and no pop-ups. All you have to do is click the button, spin the reels and enjoy. 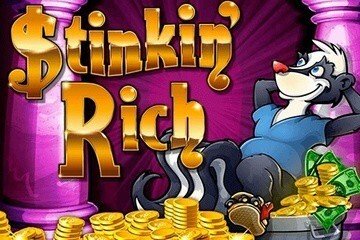 Stinkin Rich is different from a lot oft he modern games, because it has that cartoon fun to it that used to be popular when video slots first appeared in Vegas. Plus, it has additional bonus rounds that are fun and animated, rather than just one simple free spins round. In that respect, this game is similar in style to classics like Lobstermania, Texas Tea, Trailer Park, Money Storm and Fortune Cookie. Stinkin Rich has not one, but two bonus rounds to explore. This is the free spin bonus in Stinkin Rich. You get 5 free spins, multiplied by the number of triggering paylines, so you can get quite a few in total. When you hit 3 cash for trash symbols, you get a random win automatically. At the very least you will be awarded 6x your total bet, but it could be as high as 40x if you are lucky.